The People's Republic of China is opening wide its doors to Western ideas, culture, and business. It is very anxious to promote cultural exchanges at many levels. In 2001, the China International Travel Service, along with the governments of Beijing, Xian, Guilin, Guangzhou and Shenzhen exclusively requested Music Celebrations International to bring American ensembles to China and perform in the top music conservatories and interact with their music students to help them build their music programs. This has now led to the annual American Celebration of Music in the People’s Republic of China. Recommended bands, choirs, and orchestras are now annually invited to perform in the most prestigious concert halls throughout China. No other place on earth possesses such an intensity of beauty and strangeness, nor has a longer, richer historical legacy, and few other nations are likely to be as important in the 21st century. 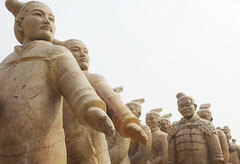 China's culture remains exotic, despite rapid modernization and growing Western influences. 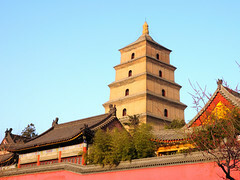 It is now possible to travel to most of the interesting places in China in a style not dreamed of ten years ago, or barely possible five years ago. 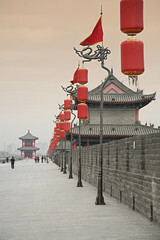 China travel is a mobile feast of sights and sensations, new and old. Chinese art and history are a constant delight, and to see China's past made visible, whether in the vaults where the First Emperor died among his terra-cotta armies or in the Forbidden City where the last emperor was born, brings the dreamy Middle Kingdom to life. The interest by the Chinese in Western culture is such that an American orchestra, choir or concert band can captivate a large and enthusiastic audience no matter where it performs. Imagine your musical group performing near the Great Wall, an ancient city square, a cultural center auditorium, or perhaps participating in a musical cultural exchange at a Chinese school -- all these things are possible! Music Celebrations International and their official Chinese colleagues are ready to transport you to another world -- the Middle Kingdom! The USC Trojan Marching Band recently concluded a very successful tour of China. The band received a good deal of press in China. Full-color pictures appeared on the front page of the China Times in Beijing as well as the local Xi‟an newspaper. The highlight of the trip was, of course, the performances. 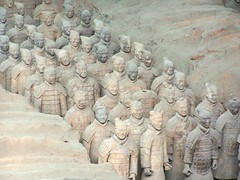 The band performed at the Great Wall of China. (The band) also performed to large local crowds…. (and) participated in an exchange with a local Beijing elementary school…known for its award-winning traditional Chinese orchestra…it was a great exchange enjoyed by all. If Americans don’t do this tour, they are nuts! We were treated like royalty everywhere we went. This was the most amazing trip I could ever imagine. The cost of the trip for what we got was such a good bargain. The meals were so wonderful, the tour guides were all great, and every concert was just awesome. It was terrific! We don‟t know where to begin to thank you and your MCI China Team for taking such excellent care of us during our two week visit to China. Your service to us showed genuine care and concern and your personal touches and attention to detail did not go unnoticed. Your Team did an outstanding job on marketing our performances and your enthusiasm for our music-making gave us a real lift. We were thrilled with the crowds at each performance; they were indeed very attentive also. Your team was so professional, kind, patient, courteous and genuinely cared about each individual on the tour. In business “giving the client more than they expect” is good business. Sincere thanks to all. (MCI) did an extraordinary job of providing us with one of the finest international tours with which I have been associated. The concert venues were superb. They were large facilities with stages and adequate room for the orchestra. Audiences were excellent with an average of over 700 persons in attendance per concert or close to 5,000 total. The arrangements at the concerts were above and beyond all expectations. The tour has made a lifelong impression on our students in numerous ways, many of which may not surface for years to come. Our students shared their music, their culture, and their friendship in a manner that reflects very positively on our school, community, and nation. Each night we discovered that there were Chinese officials and music directors in the audience that had come to specifically hear the band from the United States. (The) administrators were very impressed with everything on the tour and felt it was one of the greatest experiences we could ever have given our students.